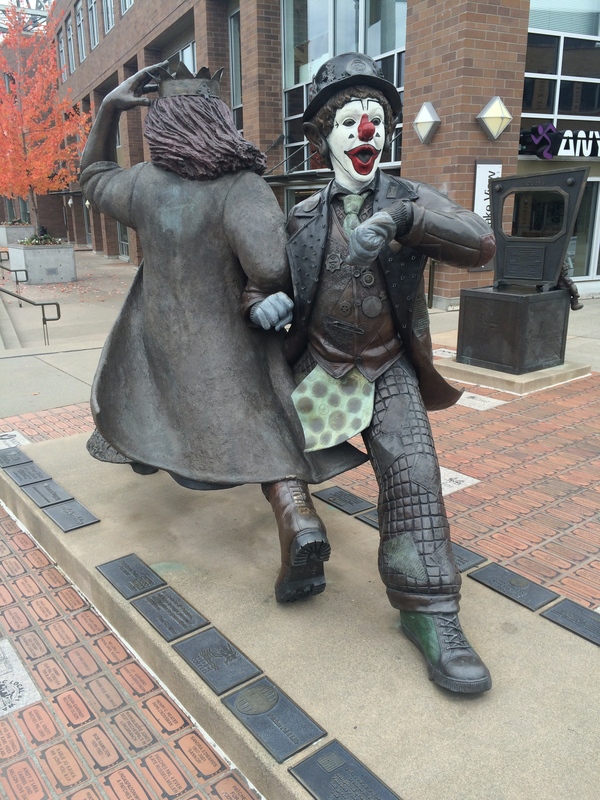 De Libertas Quirkas means ‘the freedom to be peculiar’ and is the unofficial motto of Fremont. It appears on various websites and brochures about the area. Fremont really is the perfect place to have Groundspeak HQ. I’m sure we can all remember a time a muggle described geocaching as ‘weird’ when we explained it to them. Who wants to be normal anyway?! A little disclaimer before I start: there are likely spoilers below for the Geocaching HQ Tour caches. You have been warned! 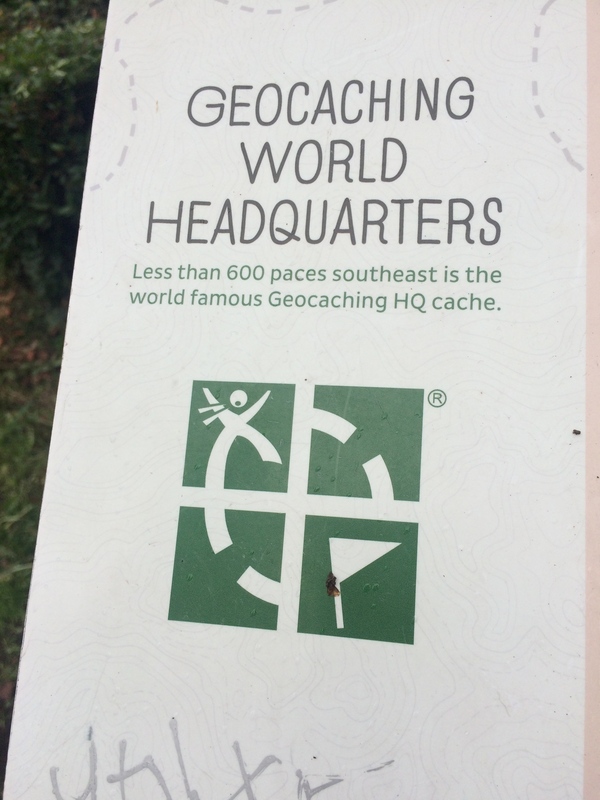 For those that don’t know, Geocaching Headquarters (GCK25B) is an actual cache you can log and it even has its own icon. The office is located in Fremont, a Seattle neighbourhood north of downtown. 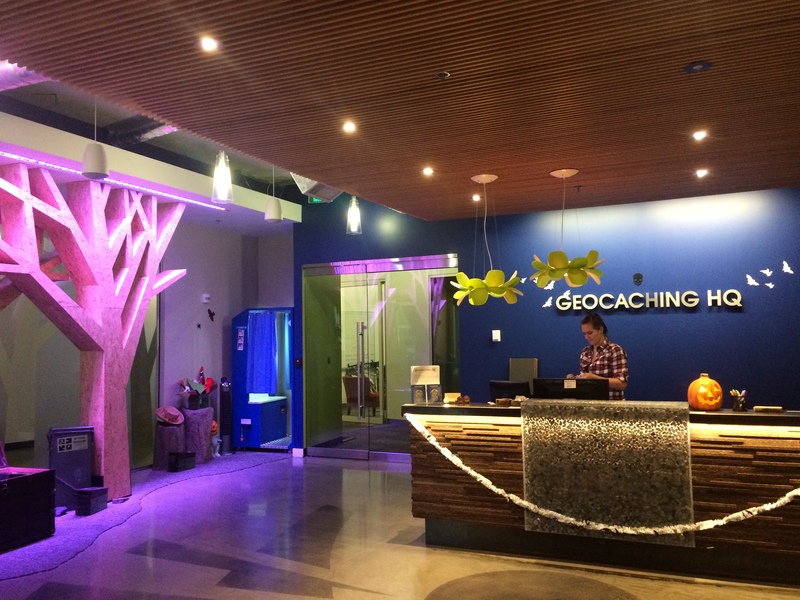 Since the employees, or lackeys, as they’re widely known, have actual jobs to do, visits are restricted to specific drop in hours.You can find all the information you need to plan your own trip at the Geocaching HQ website. I hadn’t planned what order to do the caches in (which was silly and quite unlike me), so I just went to the closest one and started doing them one by one. I had started more or less in the middle, so it took a bit of walking to complete them but I still finished with half an hour to spare before my HQ visit. Obviously, there is a lot of hype about the GeoTour caches since they’re ‘Groundspeak approved’ so I expected a few of them would be good. Little did I know, I would love them all! There are nine caches in total and they take you on a tour around Fremont, which is a must-see neighbourhood, even if you’re not a geocacher (muggles/reluctant-geocaching-participants will really enjoy walking around Fremont too). 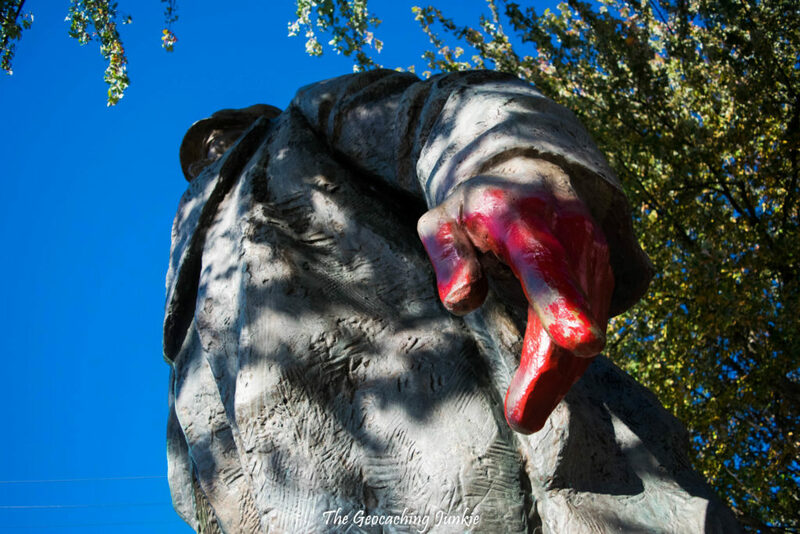 Frequently referred to as The Artists’ Republic of Fremont with a plethora of cool street art, it even has its own rocket (made from military surplus) and a controversial statue of Lenin that was salvaged from Slovakia. 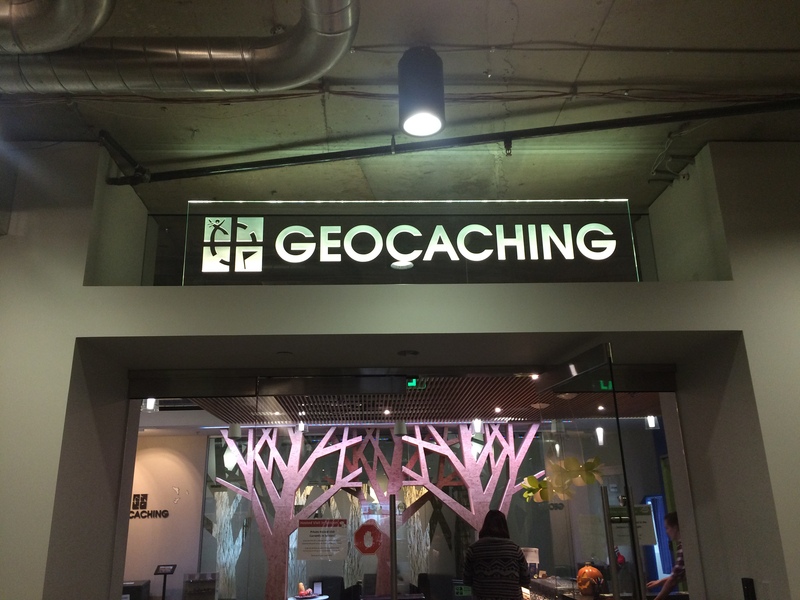 As I headed to the first cache, I walked past an information sign that mentioned Geocaching Headquarters. This was more exciting to me than it really should have been. When searching for the first cache, I felt a bit exposed uncovering it and signing the log as it was very much out in the open. However, nobody blinked an eye and in truth, nobody looked at me twice all day, despite the fact that most of the caches are hidden in plain sight. All the local muggles are obviously in the know and regularly see this sort of thing: Fremont really is the home of geocaching! 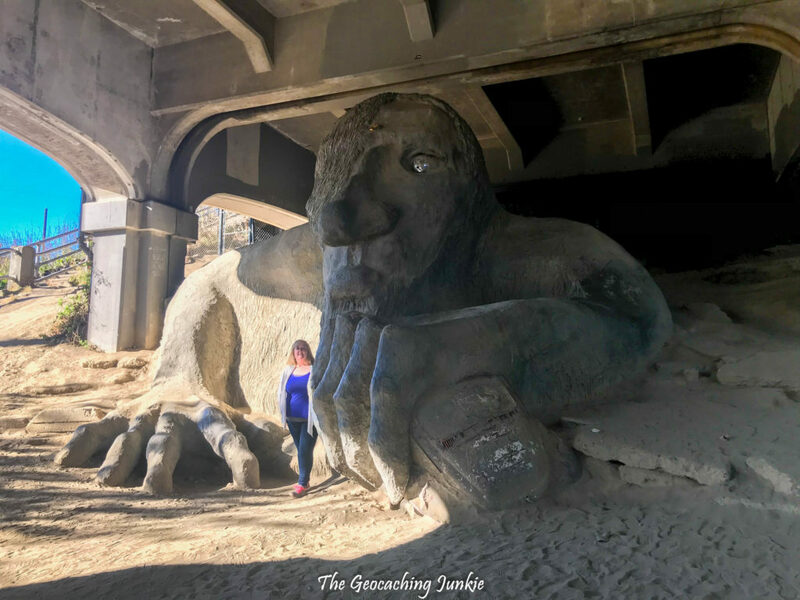 I was very excited to see the Fremont Troll, and there is a HQ GeoTour cache hidden nearby called ‘Troll Droppings‘. Since it was a Friday in October, the place wasn’t too thronged so I managed to not only snap a photo without anybody but the troll in it, but also find and retrieve the cache unseen. Win! The Geo Post Office was very cool – a full size newspaper vending machine with a huge travel bug on the side so you can’t mistake what it is. There is a basket inside with the logbook and various postcards. You are supposed to take one and write a postcard to a geocacher anywhere in the world. You then put it in the corresponding pocket (I sent mine to a cacher in Dublin so put it in the ‘Europe’ pocket) and a future finder should pick it up and help it get to that cacher. You can naturally take any postcards with you that you can help get closer to their goal too. I picked up two that are headed to Belfast – I just have to find a cache big enough for them now! 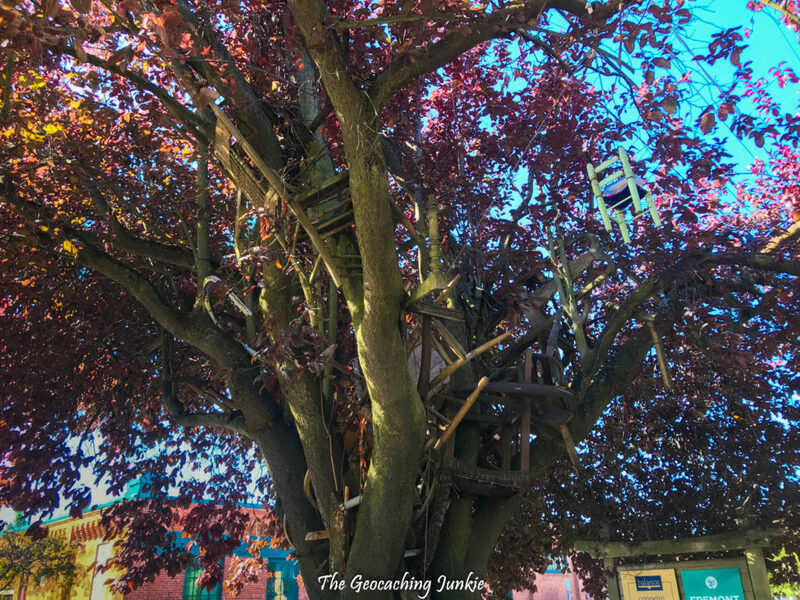 The Chairy Tree is, quite literally, a tree full of chairs, which is pretty cool in itself but the cache – WOW! It is AWESOME (and I don’t use that word liberally). I really don’t want to give the game away here as you need to be surprised to experience the full effect but needless to say, I loved it and it has more than earned its 1,550 favourite points to date! The Ode to the Golgafrinchan Phone Workers cache is the most popular cache on the tour and it’s easy to see why. 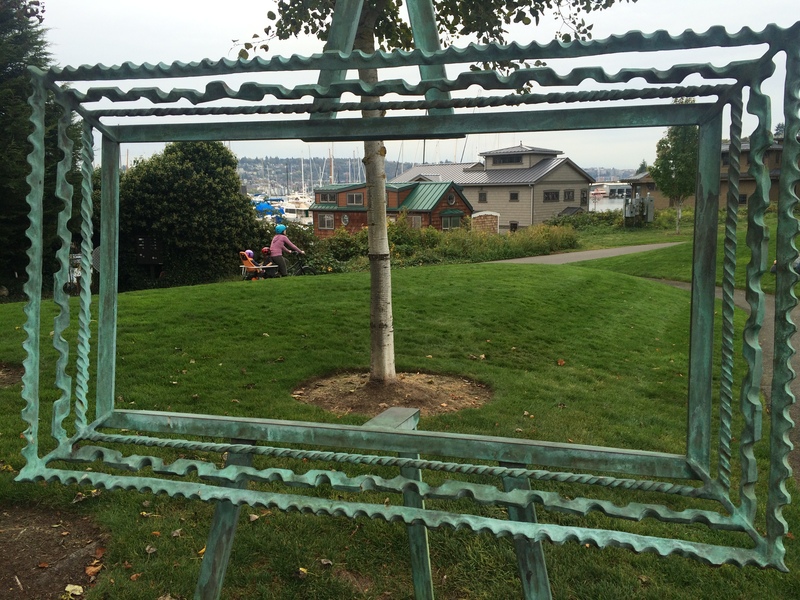 The cache is located just outside the History House of Greater Seattle, a historical musuem, which also houses a cafe where people can sit out front. I felt really awkward walking up to this ‘phonebox’ with people all around me but nobody paid any notice. 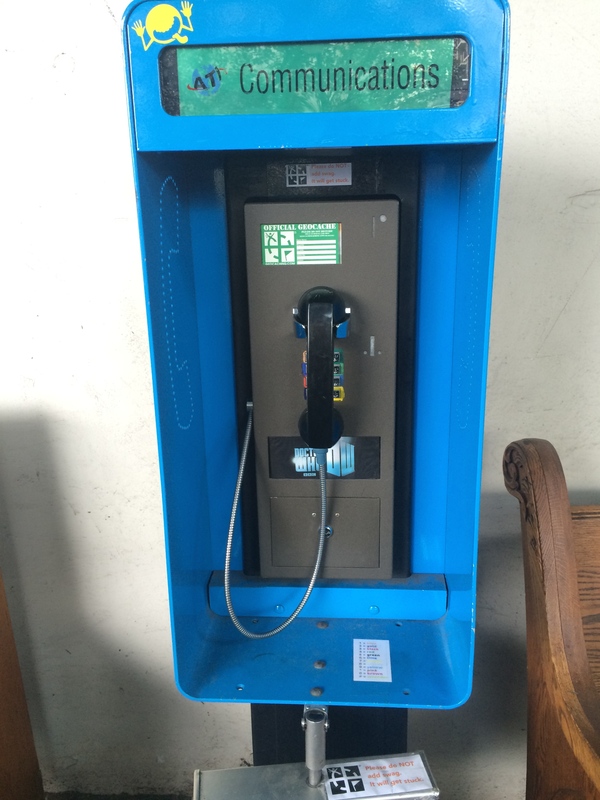 When you pick up the phone, you get a geocaching message and then you have to figure out how to access the cache. Definitely a favourite! 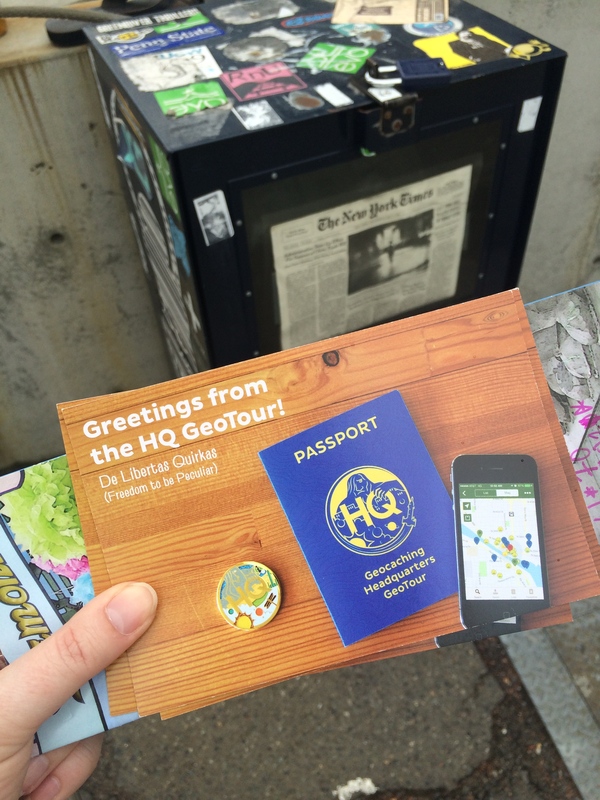 After completing all the GeoTour caches, I followed my compass to the coordinates for the Geocaching HQ cache. And guess what? I couldn’t find it. For some reason, I thought there would be a ‘geocaching’ sign outside and I couldn’t find that so I was drawing a blank with a multitude of office blocks to choose from and no obvious signage. In the end, I had to ask a passerby and he, of course, knew exactly where it was, even down to what floor it was on. I was the first to arrive but was soon joined by a couple from the Netherlands, a couple from Canada and another cacher from Arizona. While I waited for the others, I enjoyed the free snacks, looked around for the various trackable codes to be discovered and had fun in the photo booth. Lackeys Holly and Jen gave us the lowdown on the history of Groundspeak and hinted that there was ‘something big’ happening soon, when someone asked about lab caches. Cryptic but they were staying tight-lipped! The entire visit takes place in the reception area of Groundspeak, where you can look at the many trackables (many owned by Jeremy Irish), browse the geocaching shop and, of course, sign the logbook. I was lucky enough to have met lackey Annie (Love) at an event she hosted in Dublin last year, so I contacted her in advance and arranged to meet to hand over the logbook from the 15th birthday event we had in June for GC43. Annie offered to give me a ‘backstage tour’ and I jumped at the chance to see where the magic really happens! There are multiple ‘Best Place to Work’ awards hanging on the walls and it’s not hard to figure out why: ping pong, Xbox, Lego, candy, beer…. how they get any work done is anybody’s guess! I also got to see the memo board where the geocoin design team puts blueprints for future coins – very cool! 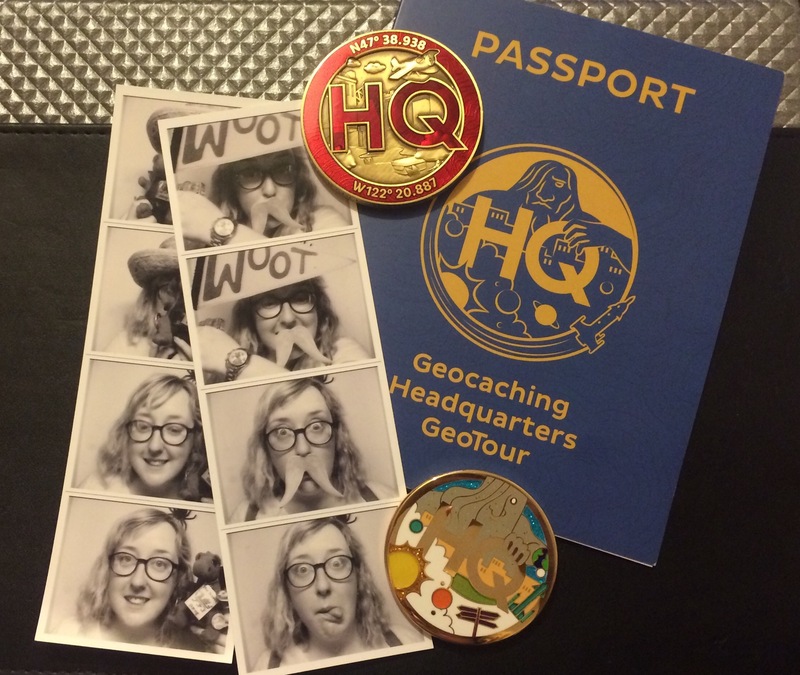 Holly informed us that there were three items to buy in the shop that could not be bought anywhere else, so of course, I had to purchase all three: a Geocaching HQ geocoin, a Geocaching HQ GeoTour geocoin and a T-Shirt that says “Geocaching HQ: Been There. Logged That.” I also bought a mini Signal toy, just for good measure. 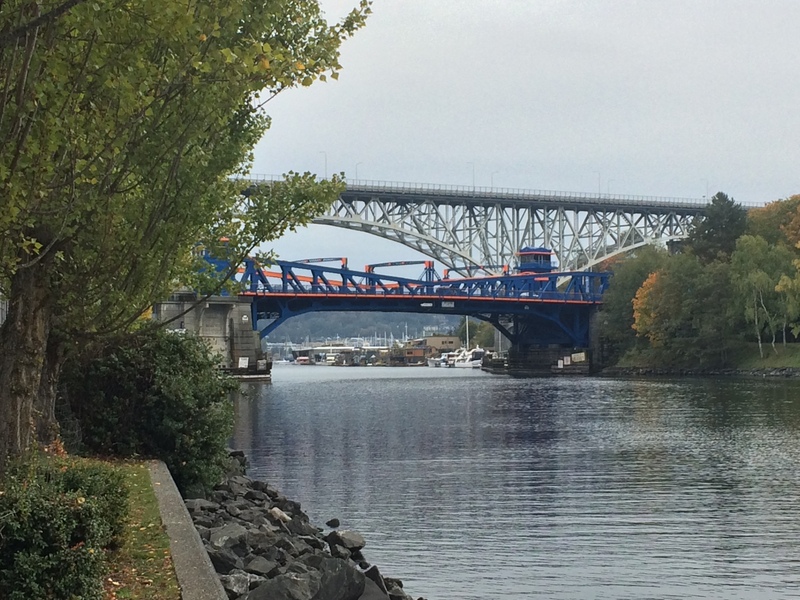 I thoroughly enjoyed my afternoon in Fremont and highly recommend making the pilgrimage to Seattle to tick off this corner of the Triad. Now that I’ve been to the Original Stash and HQ, the only missing piece of the Triad is the last remaining A.P.E. cache in Brazil. Maybe one day…..
Great write up, jealous much! Thanks for sharing your experience. 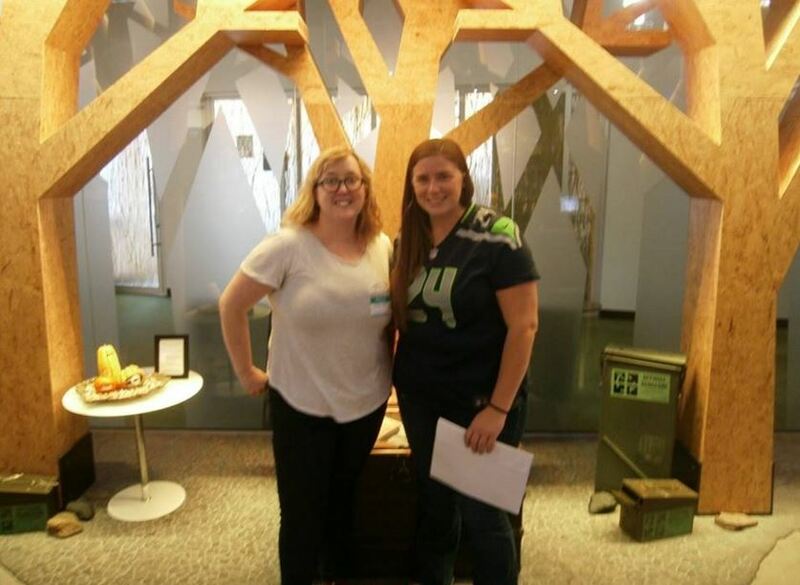 Yay, it was so good to see you on our visit to HQ! See you next time I’m in Ireland!